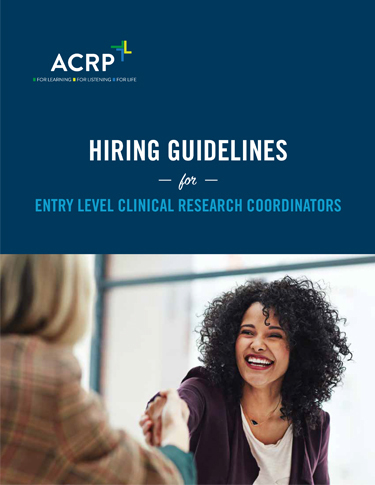 ACRP’s Hiring Guidelines for Entry Level Clinical Research Coordinators (CRCs) is the industry’s first comprehensive set of competency-based guidelines for hiring entry-level clinical research coordinators (CRCs). Standardizing and professionalizing the career of CRCs. The objectives of these guidelines are to help those who hire entry level CRCs better hone and prioritize their hiring process to focus on the competencies that are most predictive of success. To receive a PDF copy of the white paper, complete the form below. Be sure to check your email containing a link to download the file. By submitting this form I acknowledge that the information I provide may be used to create a free ACRP account or update my existing ACRP account. I also consent to receiving email communications from ACRP.